Yesterday I introduced to you one of my friends (and yours), the Green Delicious Apple Friend. Actually I have more than one such friend and you probably do, too. These are the friends we love but we don’t necessarily love being with. Why? Because somewhere along the way, maybe even early on, the “conversation” of your friendship soured. It may have soured with excessive self-talk, constant interruptions, self-pity, bitterness, complaining, bragging or even just plain bad manners. Whatever the souring agent, it was enough to make you pucker up with a little self defensiveness and even avoidance. But we also discovered that while even Jesus had a Green Delicious Apple among His friends (Judas), He managed to continue to treasure this tart relationship to the bitter end. He treated Judas just as He did all of His other friends– with love and kindness and respect and grace. If we’re to treat our Green Delicious Friends with the same sort of grace with which Jesus treated Judas, we’ll need to “sweeten the conversation” of those friendships to the best of our ability. 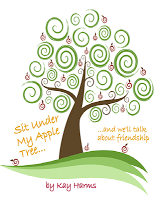 Just as you might add a little brown sugar and cinnamon to a half a dozen Green Delicious Apples to make a juicy, sweet pie, you can sweeten the conversation with your Green Delicious Apple friend through gracious words and attitudes. We may not be able to change the other person’s part of the conversation of our friendship, but we can certainly go out of our way to keep our portion graciously sweet. I have a Green Delicious Apple friend who qualifies as such in my mind because, quite honestly, she talks too much about herself, especially her troubles. Of course, I feel sympathetic about her struggles, but I do get weary of every conversation revolving around them. So yes, I tend to avoid my Green Delicious Apple Friend. That’s not a pretty thing to say, but it’s the human truth. But recently, as I put this study about friendship together, I became convicted about my need to sweeten the conversation with my Green Delicious Apple friend…we’ll call her Sandy. Why? Because, as much as I may avoid her in order to steer clear of our Sandy-centered conversations, I also really love her. She is a good, sweet, gracious, and giving woman. So she deserves better from me than avoidance. First, I prayed about it. I asked God to show me ways to sweeten the “conversation” with Sandy. Then I thought on it, intent on finding some creative way to “make apple pie out of this Green Delicious Apple friendship.” Then I made a few attempts at doing just that. The next time I saw Sandy, instead of asking her, “How are you doing?” I asked her a more specific question, something along the lines of, “How did you enjoy your Sunday School class this morning?” To my surprise and delight, Sandy answered that question with enthusiasm and joy. She didn’t mention any of her recent aches and pains. On another occasion when I ran into Sandy, I again avoided my usual inquiry into her well-being and asked instead, “What have you been knitting lately, Sandy?” Without any reference to her usual problems, Sandy happily filled me in on her latest project. Now, that’s not to say that I’ll never listen again to Sandy tell me about her physical problems or wearisome struggles. But the fact that we’ve found a new launching place for our conversations gives me the hope that I can listen to her problems with more patience and grace in the future. I think Sandy just needed a little help finding a new way to carry on a conversation. She had fallen into a bad habit and when I stopped focusing on my disdain of that habit I managed to give a little grace and help her find her way to a better way of making conversation. Folks I’m not saying I saved the day. But I am saying that I took my share of the responsibility for our friendship and did what I could to work us out of a soured situation. Might you need to do the same with a friendship gone tart? But I’ve found that with a little courage and responsibility we can salvage even the greenest of Green Delicious Apple friendships. It just takes a little grace and creativity…much like the sugar and spices you add to a delicious apple pie! 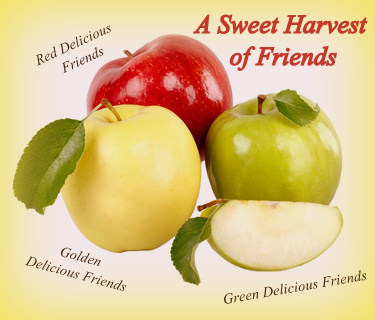 What have you done to sweeten the conversation of a Green Delicious Apple Friendship? Would you like for me to pray for a particular friendship you have in mind? I’d love to do that for you. Just let me know!